The female trio's new album is equal parts inviting and distanced. Acts like Au Revoir Simone and fellow indie synthsters Chvrches are proof that the hushed, soothing techno-lullabies of Broadcast are becoming an increasingly pervasive influence on modern music. Not to say that any of those bands are straight lifts -- in the case Au Revoir Simone, the all-female New York trio uses established elements to construct winsome pop songs that are laudable for their minimalist maximalism. What does that mean exactly? 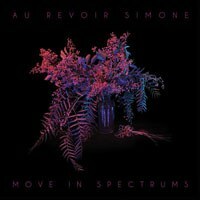 It means that while Au Revoir Simone aims for a big sound with maximum impact, it pieces together its compositions by using as few steps as possible to achieve that goal. Call it the Nirvana or AC/DC Principle. Listen to the introductory track "More Than" with its irresistible repetitions of "Tell me what you want" in the choruses and ask yourself, does it need anything more than that? Considering those words are sung in wondrous harmonies that beg to be described with such hipster-friendly terms as "girlish" and "honeyed", the answer has to be no. Streamlined for optimal performance and supplemented by a generous application of hooky melodies, Move in Spectrums has no hang-ups about its pop-ness, and that contented nature makes some already very hummable tunes all the more inviting. The way the jaunty first single "Somebody Who" sways, I can virtually imagine its words emanating from the peroxide-white smiles of some '70s MOR act. In other places Au Revoir Simone is less direct yet no less alluring. Take "Boiling Point", which is breathy not just in the obvious way the vocals are performed, but in how the keyboards seem to in- and exhale, the bass notes below as reassuring in their low steady thudding as a lover's heartbeat. The less likely "We Both Know" is even more astounding, a song that is able to rely on its majestic bell-like tremors for over three minutes before any words are even uttered. For all its luscious singing and soft, soothing synth tones, Move in Spectrums exudes a certain chilliness. Whether due to the instrumentation or the stark yet echoey production, the record has an icy, crystalline beauty about it -- impeccably sculpted and fragile, it feels as it one warm breath would cause the music to dissipate in a fine vapor. It's a distancing quality, and as such the record always feels a step removed, allowing listeners little more than admiring glances and rarely permitting them to get up close and personal. One of the few instances where Au Revoir Simone steps out into the sunlight is the clear standout "Crazy". It's a propulsive encapsulation of swoony wanderlust, with its incredibly hooky refrain of "Oh you girls drive me crazy" compelling you to join the group for a promising journey that will hopefully never end. Like "More Than", it's an instant earworm, as well as a welcome reminder that this isn't a record created by igloo-dwelling robots. Given than electronic indie pop bands are fast becoming a dime-a-dozen, it's nice to be reminded that on this record at least there's a human heart behind all that shiny, pretty music.